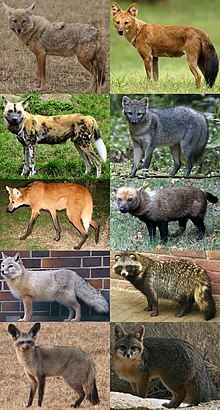 The Canidae /ˈkanɨdeː/ is the biological faimily o carnivorous an omnivorous mammals that includes domestic dugs, woufs, tods, jackals, coyotes, an mony ither lesser kent extant an extinct dug-like mammals. A member o this family is cried a canid (/ˈkeɪnᵻd/). The Canidae faimily is dividit intae twa tribes: Canini (kin o woufs) an Vulpini (kin o tods). The twa species o the basal Caninae are mair primitive an dae nae fit intae aither tribe. This page wis last eeditit on 29 Dizember 2015, at 06:07.